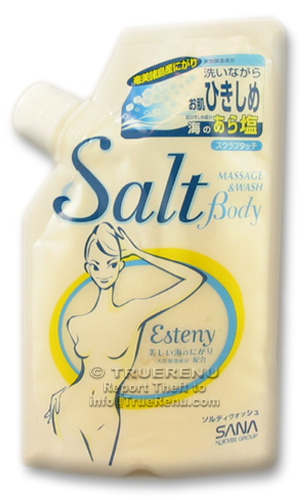 Clean and exfoliate naturally with floral scented, smooth-grain sea salt and soothing aloe from Sana of Japan. Mineral-rich smooth grain sea salt cleanser gently removes dirt, odor, and dead skin cells from arms, legs, back - all over your body. Contains natural palm cleansing ingredient to spread well. Also contains aloe, honey and natural bittern (from beautiful Amami islands) to give skin moisture. Comes from Japan in a flexible plastic pouch with a resealable dispensing spout for easy use. English usage instructions and ingredients included. Scrub away dirt and dead skin with this luxurious body salt and wash. Extremely effective at exfoliating the body, and also recommended for cellulite massage. Has an assertive floral fragrance and low lather. Gentle and soothing on all but the most sensitive skin types. Squeeze desired amount onto a wet towel or palm and apply. Rinse thoroughly. Ingredients: Sea salt, water, potassium cocoate, cocamidopropyl betaine, sodium cocoamphopropionate, tea-laurate, sodium laureth-3 carboxylate, fragrance, tocopherol, bittern, aloe barbadensis leaf juice.